With almost 30% of our student body of Hispanic heritage, it has become imperative for us to better understand their culture. Projections are that the Hispanic student presence will continue to rise within our classrooms when we consider that, according to the 2010 Census, the Latino population within the City of Lawrence, and surrounding communities (e.g., Methuen) increased by about 12 percent. With this increase, the importance for faculty and staff to better understand the Hispanic culture has become even more important. In this workshop we will explore persistence and completion rates among Latino male students at NECC. We will also examine “cultural cleavage,” or gaps within our classrooms between Euro-American pedagogies of teaching and learning based on the individualistic perspective, and that of the Hispanic student of learning based on the collectivistic perspective. We will also discuss the larger Latino/Latina population at NECC in order to better understand cultural issues and misunderstandings that may arise for both faculty, staff and students. This issue of cultural dissonance has been a key concept in the research conducted by the Hispanic Males Staff Faculty Inquiry Group headed up by Jorge Santiago and Charles Diggs. In addition, this SFIG is engaging in a major research initiative in the fall involving Latino males and reading. This symposium will feature some of Dr. Santiago’s research findings as well as conversations with Gisela Nash, Associate Director of Student Success Programs and Niurka Aybar, Associate Director of Community Relations. 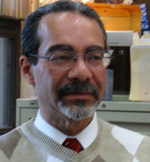 Dr. Jorge Santiago is not only Hispanic himself (of Puerto Rican descent) and has lived within his cultural heritage, he has studied his culture extensively, while also straddling the American culture. Santiago has published on important issues related to the Hispanic community in Lawrence, as well as provided many presentations concerning the Hispanic culture and community. Latino students. She serves as advisor to the Tertulias Club and coordinates the Hispanic Cultural Enrichment Program. Niurka Aybar, a Dominican Republic native and a former NECC student, has worked for the college since 2003. In her existing role as the Associate Director for Community Relations, Mrs. Aybar acts as the college’s liaison with the Lawrence community working with non-profits and local community agencies. Aybar represents the college at community events and serves in several community boards. To support her work in Lawrence, Aybar has created a community service group comprised of NECC students, commonly known as the “NECC SOS” (NECC Student Outreach Squad). She also works with special projects such as Dual Enrollment and facilitation of workshops. The deadline date to RSVP is Thursday, August 25, 2011.